Tuesday May 31st 1921 I took down bed-room curtains and washed and ironed them and cleaned the room in afternoon. Rested till supper time. Hattie to concert. Rob & Cora not here for supper. Hattie & I down to Otts all evening. I have felt badly all day. Very warm. Wednesday June 1st 1921 It is 34 years today since Ott & Fannie were married. I did some sewing in forenoon and went to town with Rob after dinner. Was at Otts office a little while. A hard shower at that time. Later I went to Mrs Jones to call on Mrs Leighton. Home with Rob. Wrote to Aunt Sarah in the evening. 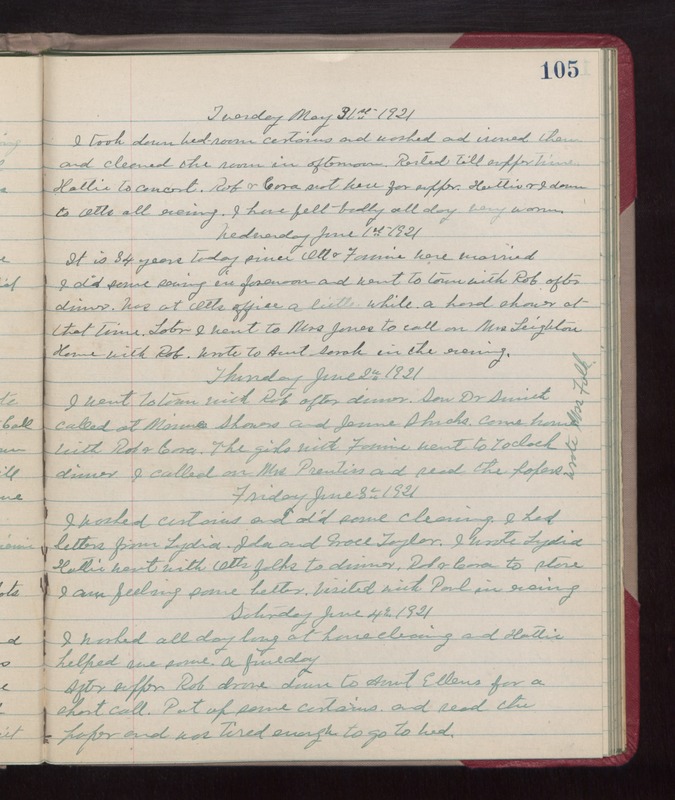 Thursday June 2nd 1921 I went to town with Rob after dinner. Saw Dr Smith called at [Marne?] showers and Jenne Shucks. Come home with Rob & Cora. The girls with Fannie went to 7 oclock dinner. I called on Mrs Prentiss and read the papers. wrote Mrs Falk. Friday June 3rd 1921 I washed curtains and did some cleaning. I had letters from Lydia. Ida and Grace Taylor. I wrote Lydia. Hattie went with Otts folks to dinner. Rob & Cora to store. I am feeling some better. Visited with Paul in evening. Saturday June 4th 1921 I worked all day long at house cleaning and Hattie helped me some. a fine day. After supper Rob drove down to Aunt Ellens for a short call. Put up some curtains and read the paper and was tired enough to go to bed.